So... I made this squid in last semester's Three-Dimensional Design class (I'm working towards a BFA). It was a months-long process. 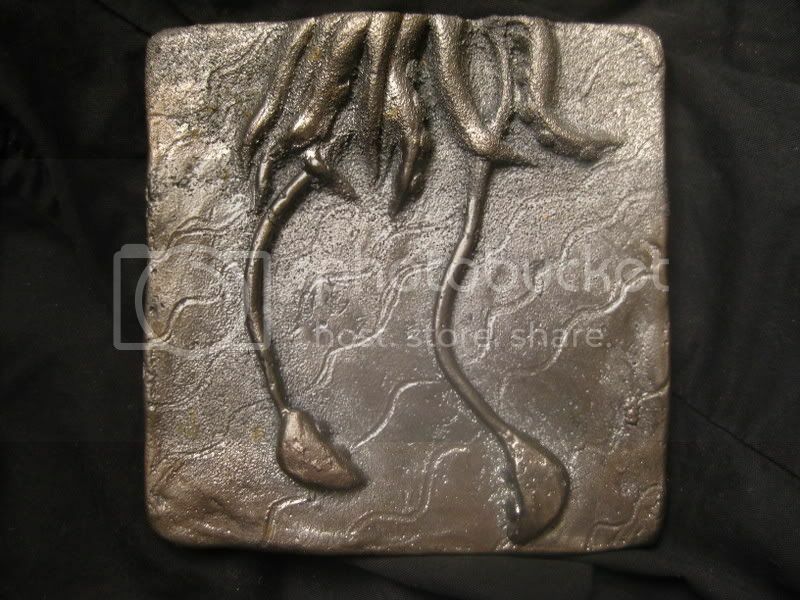 The assignment was to create a relief sculpture out of oil clay with a area of 4x4 inches. 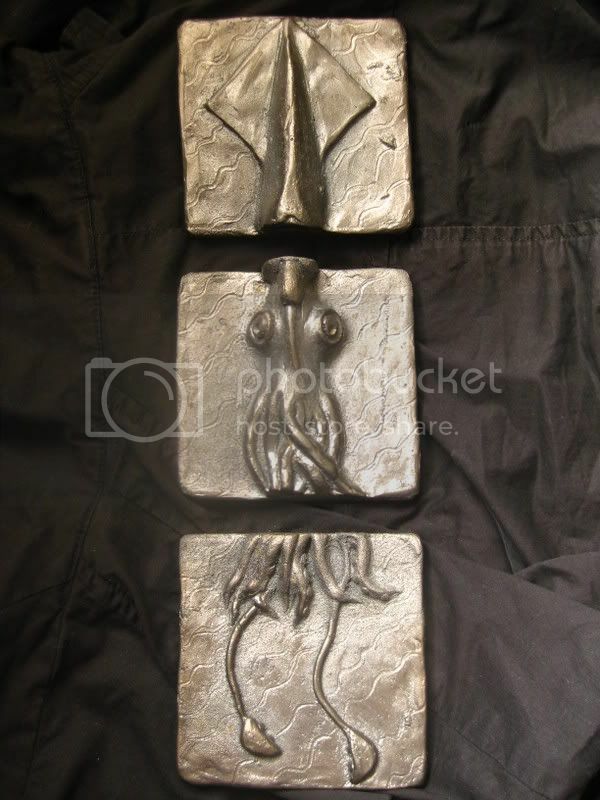 My idea was to do a squid and I got special permission to do three separate sculptures to execute my "artistic vision", haha. Let me just say that 12 square inches of cast iron is HEAVY!!! I had to lug it home in my purse on the subway... not ideal. The oil clay was weird to work with. My art teacher made it himself. It smells like motor oil and doesn't dry out. 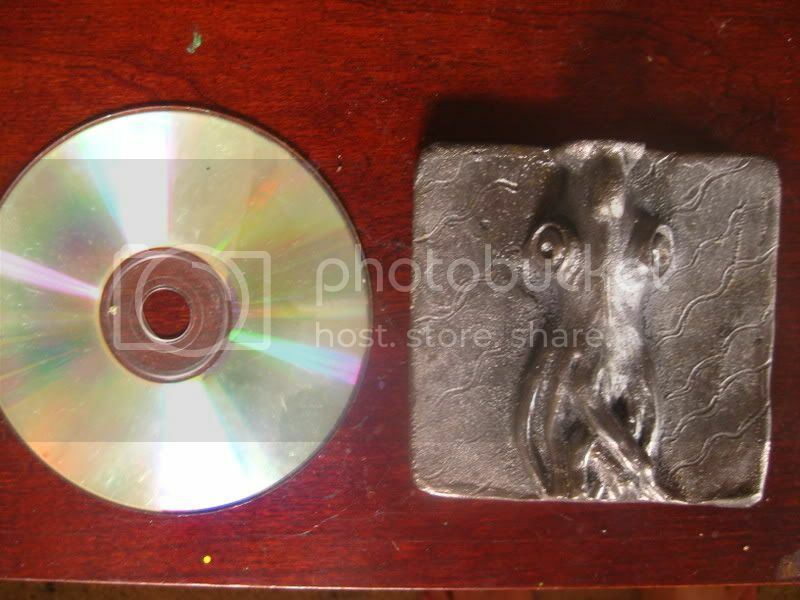 After we made the sculptures we made a mold for the casting out of some kind of weird green sand that hardened. 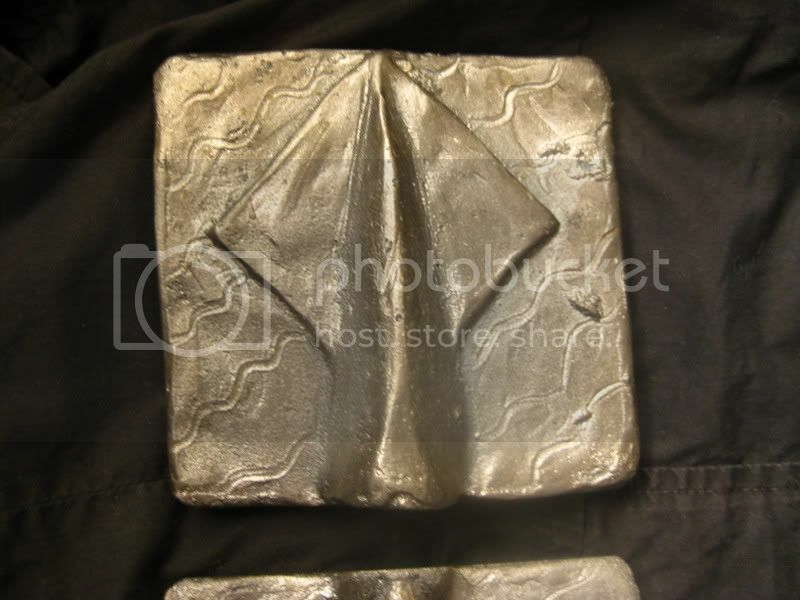 I was there for the iron pour, we did a midnight iron pour party for our class and poured red hot iron into all the molds. It was very exciting and fun to watch... like fireworks!! Oh! 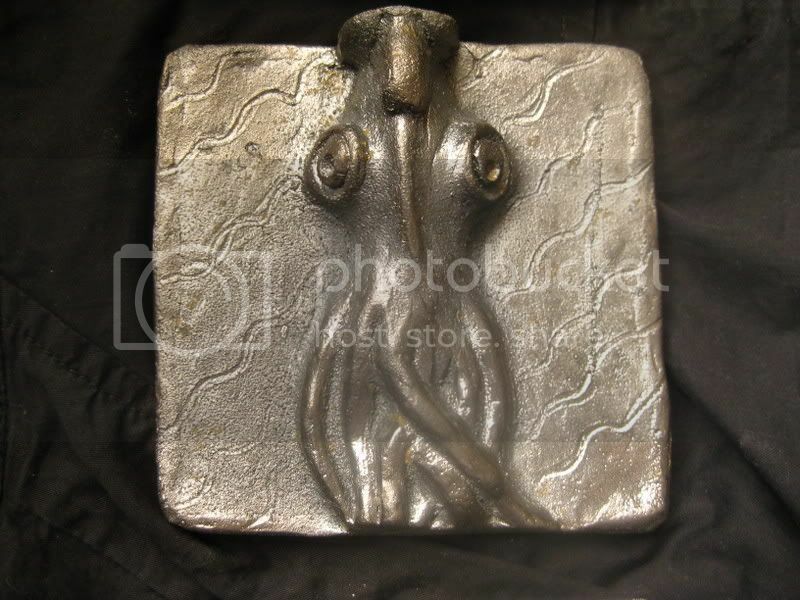 I found a picture of the original clay sculpture before I cast it in iron!! OH MY GOD!! I'm a featured project?!? THANK YOU SO MUCH YOU GUYS! You have no idea how happy that made me!! Thank you, thank you, thank you, from the bottom of my heart. I love you guys on Craftster so much!!! I never thought I'd say this about a squid, but THAT IS GORGEOUS. It seriously looks so so awesome. thats pretty cool!! 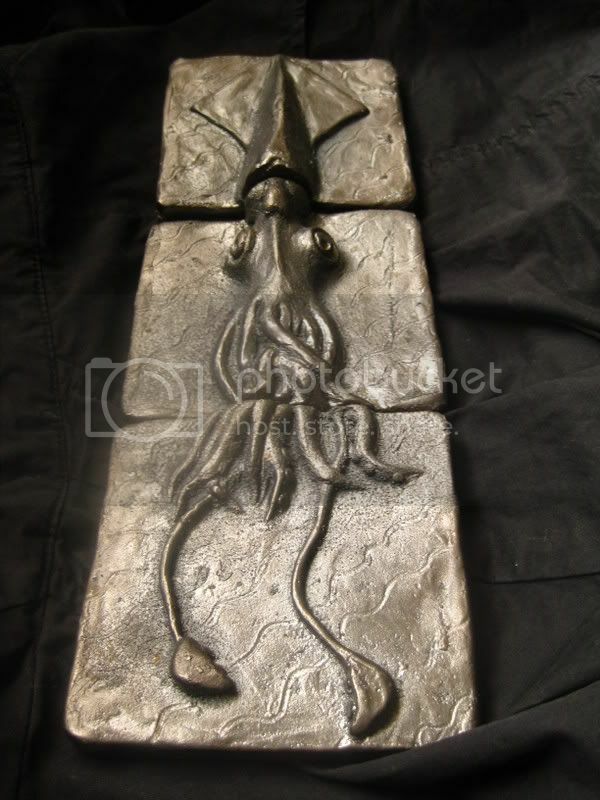 i like the three different pieces... makes it a million times cooler than a plain squid. Thanks guys! I dont know what I am going to do with it yet. As of now it is sitting on a table in my art corner. I would like to put it in a shadowbox or some kind and mount it on the wall? It is really heavy though.... mounting it on a wall might be a problem. It is starting to form tiny spots of rust.... from the moisture in the air, my boyfriend said. (I live in Georgia, USA.) So I would like it to enclose it somehow to slow down this process. WHOA!! I'm hitting this rocks, and I don't do that very often!! me loves! ah well done. skillful lady. THAT is totally amazing! I love him! Can you just spray him down with some clear spraypaint to stop the rust?